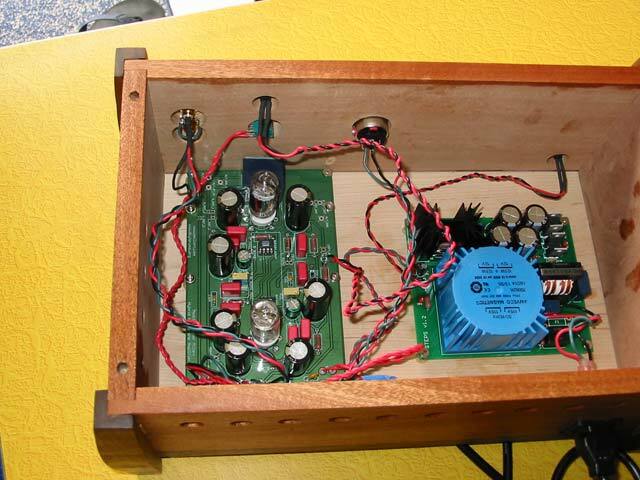 The Bushwood Amplifier. A state of the art high quality hybrid tube amplifier based on the Millet Hybrid design. The design was taken from DIYForums.org. They are really great guys to work with, and you get a lot of support while building the amplifier. I sold it because I wanted to get more into woodworking than into DIY audio. Tangent Easy Power Supply with 12.5VA (each side) toroidal transformer by Amveco, Nichicon capacitors, and other stock items as listed on Tangent’s site. I built in a 3 prong grounded plug (included) and a rocker power switch with LED indicator light. WIMA MKP10 capacitors where necessary. Integrated ALPS RK097 rotary volume knob, wired for just a power switch for the amp. ALPS Blue Velvet for volume control. Casework custom built by myself, made from African Sapele, maple, and walnut, with a danish oil/wax finish. Lid not attached for easy removal and access to all inside components.